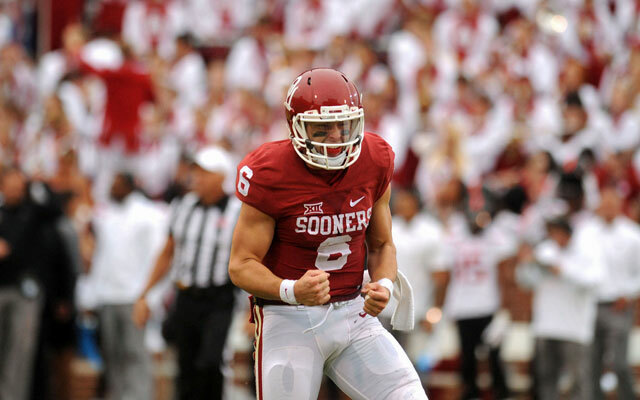 Oklahoma quarterback Baker Mayfield was named Tuesday as one of five finalists for the 2016 Johnny Unitas Golden Arm Award, given annually by the Johnny Unitas Golden Arm Foundation to the nation's top college quarterback based on accomplishments on and off the field. Mayfield is joined on the list by Washington State's Luke Falk, Texas Tech's Patrick Mahomes II, North Carolina's Mitch Trubisky and Clemson's Deshaun Watson. Candidates must be a college senior or fourth-year junior on schedule to graduate with their class. Mayfield, a redshirt junior from Austin, Texas, leads the nation in pass efficiency rating (195.8; the NCAA single-season record is 191.8) and yards per pass attempt (10.9; only one other player is above 10.0), and ranks second in yards per pass completion (15.4), fifth in passing touchdowns (27) and completion percentage (.709), sixth in points responsible for per game (23.0) and eighth in passing yards per contest (323.0). He has been even more impressive in OU's five Big 12 games, leading the league in passing TDs (20; Mahomes ranks second with 14), completion percentage (.743; Mahomes is next at .659) and pass efficiency rating (212.8; Baylor's Seth Russell ranks second at 157.2). He has thrown for 358.2 yards per league contest and has also run for 135 yards and three scores during the stretch. WATCH >> Baker Mayfield "Heart of a Champion"
The 2016 Johnny Unitas Golden Arm Award will be presented at a ceremony on Friday, Dec. 9, in Baltimore, Md. Proceeds from the event will help support the Johnny Unitas Golden Arm Educational Foundation, Inc. The Foundation provides financial assistance to underprivileged and deserving young scholar-athletes throughout Maryland and Kentucky. Johnny Unitas was an 18-year veteran of the NFL, who played his collegiate career at the University of Louisville before joining the Baltimore Colts in 1958. His career passing figures include 2,830 pass completions for 40,239 yards, 290 touchdowns and throwing a touchdown pass in 47 consecutive games. OU's Jason White won the 2004 Johnny Unitas Golden Arm Award. Other winners include Peyton Manning (Tennessee, 1997), Carson Palmer (USC, 2002), Eli Manning (Ole Miss, 2003), Matt Ryan (Boston College, 2007), Andrew Luck (Stanford, 2011) and Marcus Mariota (Oregon, 2014). Last year's winner was Connor Cook (Michigan State).